Before you mulch your trees, the first thing that you should do is to spread a liberal amount of compost pile around all of your trees. This should be done at the very start of spring. Don’t start mulching your trees right after. Instead, wait until the first big spring rainfall helps the compost get deep into the soil. If you’re impatient, you can always water it yourself, which will speed up the process. After it’s been ingrained into the soil, wait at least a week before beginning the mulching process. To mulch your tree, you should use between 2 to 4 inches of mulch. It should be spread around the tree, specifically its perimeter, but make sure that it’s evenly spread around it. You don’t want to have certain parts that have more mulch than others. Try to be as precise as possible. The eye test will be your best and most practical guide. 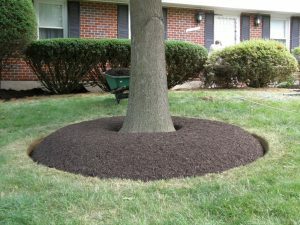 You should make sure that you don’t cover the root flare of the tree with mulch. The root flare is the part of the tree in which the trunk ends and the roots start. It’s vital not to cover this area with mulch, since it’ll create a highly-conducive environment for various bacteria, fungus, pests, and other diseases to form. This mistake is known as volcano mulching. As mentioned, you should only place between 2 to 4 layers of mulch around the perimeter of the particular tree. It doesn’t have to be exact, but if it’s much more than 4 inches, it could actually harm the tree and its soil. If it’s much less than 2 inches, it might not be effective enough to do anything. Once you spread the mulch around the perimeter, you will then need to make sure that it’s done so evenly. The best tool to use to do this is either a rake or a shovel. Both could actually be used, in which the rake helps to spread it more, while the shovel is used to flatten it so that it’s all even. You should use the rake to make sure that the mulch is pulled out to the very edge of the canopy of the tree. Mulching is a very important practice in keeping your tree and its soil healthy, so don’t skip out on it. If you don’t feel comfortable doing this yourself, Lewis Tree Service has close to 30 years of experience in tree mulching and would be able to send one of our ISA certified arborists to your property to complete the process. Contact us today for a free quote!